I will start with my Pandora bracelet. I have the original bracelet that they brought out first with my original charms. Then I have this bangle which I have kept for all of my Disney charms! 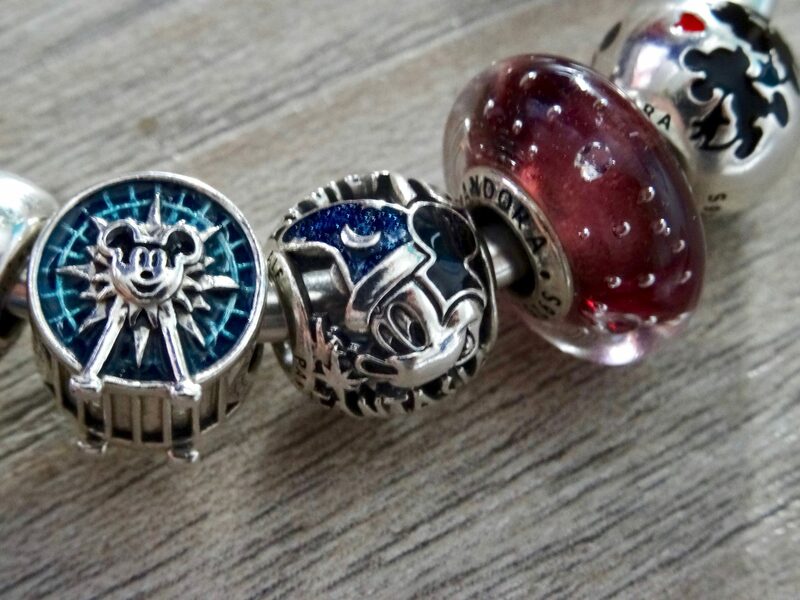 Basically, Disney now do Pandora Charms some that you can purchase in all stores or exclusively at the Disney Parks! Each time I go to Walt Disney World or Disneyland California, I like to pick myself up one. Usually they will have a meaning behind them for me. Here is a link to the charms and bracelets they do! The black charm (third in from the left) is my latest one that I bought at Christmas time. 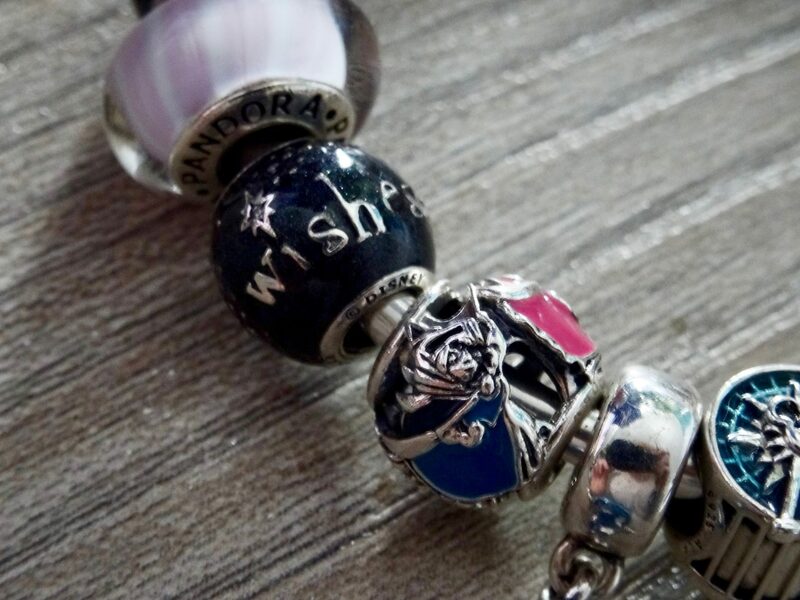 This is the ‘Wishes’ charm which was created for the ‘Wishes’ Fireworks Spectacular that they had at The Magic Kingdom inWalt Disney World every night. The Cinderella Castle would light up, the fireworks are set off perfectly in time with the music and prepare for the tears to roll at ‘Star Light, Star Bright’. I have previously posted about Wishes in my January Favourites (as the song is originally from Pinocchio – in the Disney sense). This fireworks show has been played at Walt Disney World since 2003 and it is my absolute favourite. Every single time I see this show, I have a tear in my eye and sing every single word. I am very sad that Wishes is now no longer there, but Happily Ever After is a really impressive runner up! You won’t be disappointed! So there was no question about it, I had to purchase the Wishes charm in memory of another great feature of the parks! 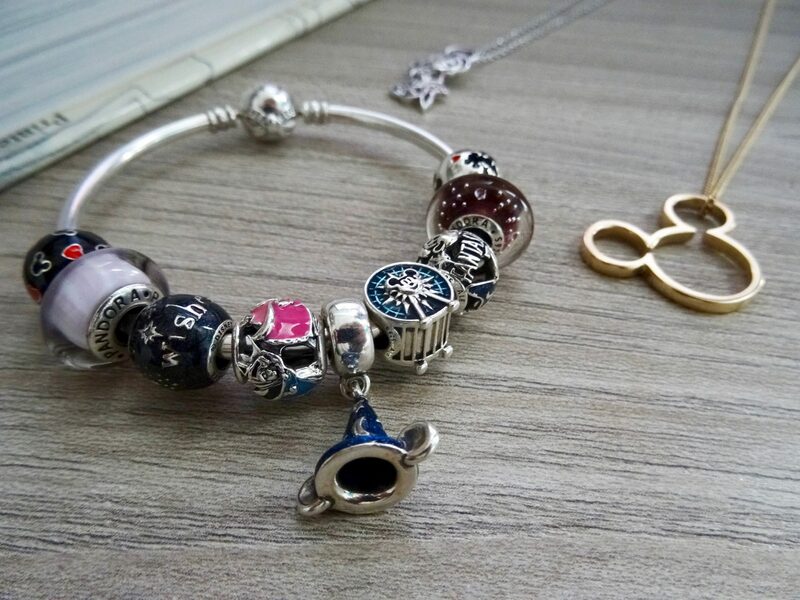 My other charms include some like the Mickey’s Fun Wheel from Disneyland California. This is one of the most iconic rides from Disneyland California Adventure Park. I visited this park for the very first time in October 2015 and I bought this charm as a reminder of my trip, which was perfect! Others I have are my Fantasia 75th Anniversary charm which I absolutely love! I am a huge Disney fan and have a passion for animation (I am a Computer Animation student, if you do not know already!). Fantasia was such a huge milestone for The Walt Disney Animation Studios as they broke through so many boundaries within animation and really experimented with different techniques and approaches to animation! 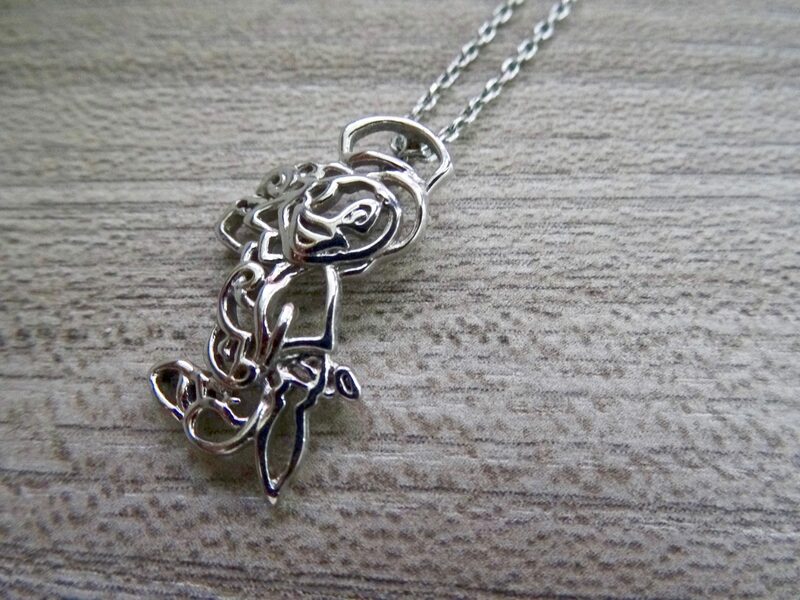 I also have a Sleeping Beauty charm which features each of the fairies Flora, Fauna and Merryweather which run around the outside of the charm. Sleeping Beauty is one of my ultimate favourite Disney movies. When I saw that they released this charm, I knew that I had to pick it up on my next holiday to Walt Disney World! 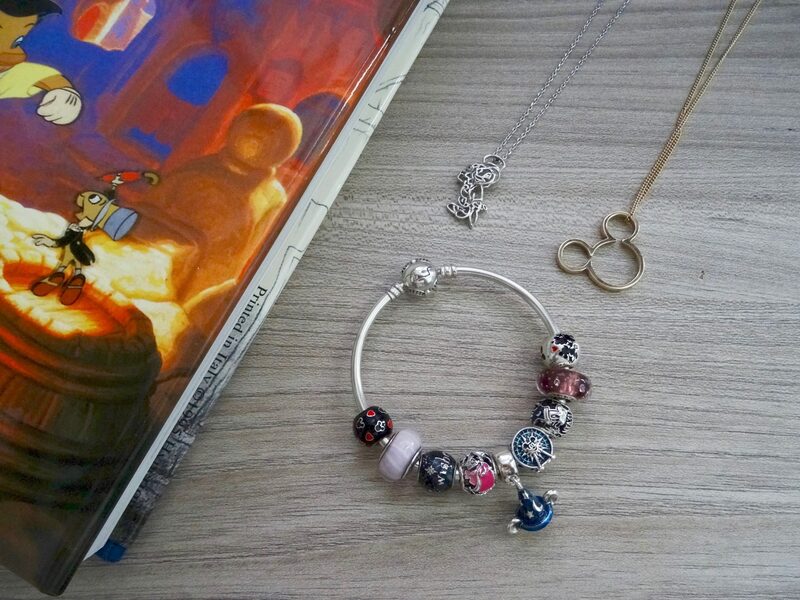 Apologies for such a long explanation of my Pandora charms. I do feel like you can really create bracelets that hold certain memories for you personally. It can be nice sometimes to explain these to others who are interested! Swiftly moving onto my next item.. My Jiminy Cricket necklace was my most worn necklace of all time and is from the amazing Disney Couture. They have so many different necklaces, bracelets, ear rings, rings.. If only there was an unlimited amount of money that I owned! I do believe that you can purchase these from the Disney Store now, too? 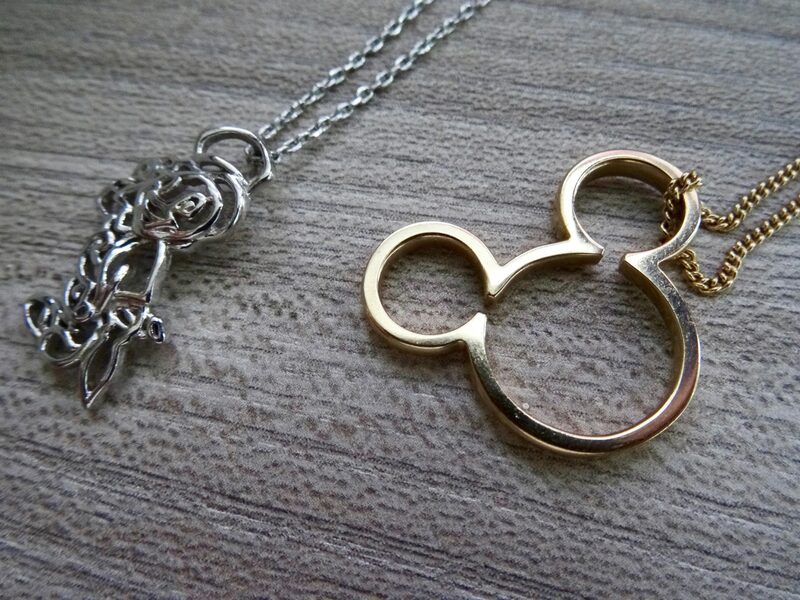 Disney Couture‘s jewellery is really affordable and they have such a huge range of characters from different films. I will leave some links to their Social Media pages and website for you all to have a cheeky look! 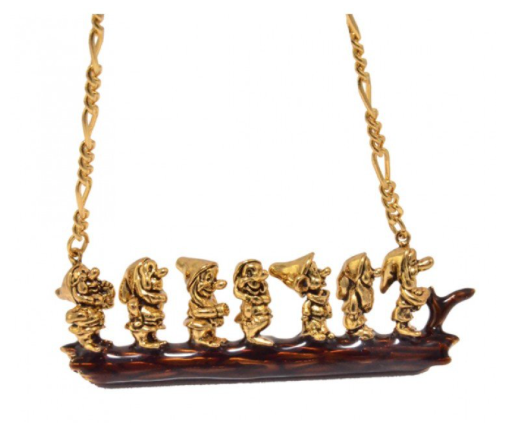 Update: I have now purchased this gorgeous Snow White and the Seven Dwarves necklace too. It is very me and I absolutely adore it! A really different and quirky piece. Moving onto my final piece, I received this for Christmas off my parents whilst we were on holiday at Walt Disney World. We decided not to buy anybody anything for Christmas and to use that money to go away to Disney for the holidays which was really different for us! I haven’t been able to find this necklace anywhere on the internet yet, but it is definitely from in the Disney parks. It is real gold and features a Mickey Mouse silhouette and it is the most perfect necklace – nothing too out there and really nice and simple! It is fair to say that I wear this necklace almost every single day, since I have had it. I love it! The only slightly similar necklace I can find online is this one here. And now we have come to the end of my Disney Jewellery collection.. I am thoroughly enjoying writing these Disney posts and look out for more to come. Including some about the Parks, what I like to wear to Walt Disney World, my Disney dress collection and more! If there’s any posts that you would like to see, then let me know and I’ll have a look into it for you all! Want to check out more of my Disney posts? What's on my Beauty Wish List?